To graph Linear Equations is a mapping process to diagram straight lines as objects. Mathematicians often diagram using Cartesian coordinate systems. 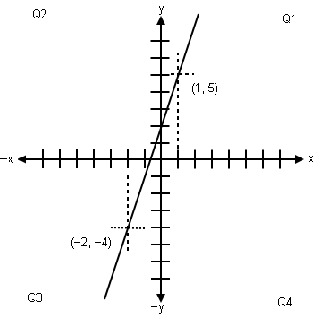 A Cartesian Coordinate System provides a central point of reference for an object and between objects. Cartesian coordinate systems are drawn by a horizontal “x” line bisecting a “y’ line forming a 90 degree right angle. Coordinates “x” and “y” are on a single plane, a flat surface. The slope of a straight line is a measure of steepness. Slope is described by a change in Rise, divided by a change in Run. Many run and rise together look like steps. 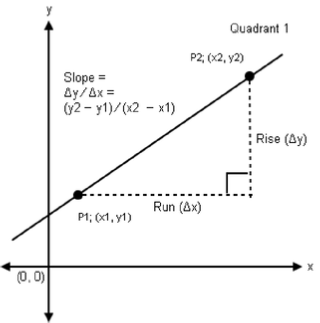 Rise is a distance Δy as y2 - y1, and Run is a distance Δx as x2 - x1 (Reference diagram below). Graph of line showing linear slope as Δy / Δx. By plugging values of “x” into a Linear Equation gives values of “y”. “Y” values for “x” integer values -3 thru 3. Choose two x and y coordinate solutions. Use them as points through which to plot the line. Graph of straight line equation y = 3x + 2 using coordinates (1, 5) and (-2, -4). and plug the slope, m , into the Slope-Intercept Equation y = mx + b. And we can now write y = 3x + 2, the Linear Equation defined by line segment coordinate points (1, 5) and (-2, -4).